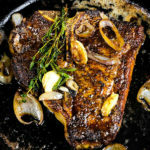 Succulent porterhouse steaks seared to perfection, and basted liberally with a garlic and herb infused butter. So fast and easy to make, you’ll skip the steakhouse for a while. Pat steak dry with paper towels, and season both sides liberally with kosher salt and black pepper. Let the steak sit for about 10 minutes while you prep the aromatics and get the cast iron skillet screaming hot over high heat. When the skillet is hot AF, drizzle in some vegetable oil. Make sure you use an oil with a high-smoke point. Don’t use olive or butter, they’ll burn and turn bitter. When the oil is shimmering and webby in appearance, place the steak down and let it sear for about 4 minutes, or until a nice golden crust has formed. Flip the steak over and cook for 2 minutes. Using tongs, flip the steak on it’s edges and sear those. Place steak back on the second side you seared, add the butter and aromatics. Safely tilt the skillet towards you and with a spoon baste the herby garlicky butter all over the steak continuously for 1 minute. Turn off the heat and keep basting for another 30 seconds. Transfer steak to a plate and pour the butter over it while it rests for about 10 minutes. This cooking method can be applied to any cut of steak. Of course, cooking times will vary according to thickness of steak.